We are a leading Manufacturer and Supplier of Polycarbonate Canopy such as Arched Polycarbonate Canopy, Curved Polycarbonate Canopy and Polycarbonate Skylight Canopy from India. 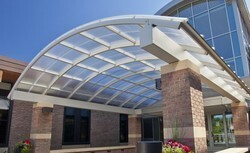 Our collection of Polycarbonate Canopy exist in various designs and patterns as per as prerequisite of our products. These canopies consist of cables and fabric in tension. Our range of products are durable, attractive and stylish. These are available for our esteemed clients at the reasonable prices. We are offering a range of Curved Polycarbonate Canopy that are available in various sizes & colors and have been appreciated among our clients for their durability. This Curved Polycarbonate Canopy are widely used for various applications by several people and organizations. Our organization is actively engaged in supplying of Arched Polycarbonate Canopy with utmost quality. Adds an aesthetic beauty to the exteriors, offered canopy is manufactured by our adroit professionals using premium quality aluminium carbonate and advanced technology in sync with set industry norms. Backed with rich industrial experience, we provide our clients with Polycarbonate Skylight Canopy, which are widely used for domestic and commercial purposes, like in Schools, Army Cantonment, Markets, and many more. Our range of Polycarbonate Skylight Canopy are manufactured using high grade polycarbonate skylight that offers them a long service life.